$1.11 Winco K-40P Paring Knife With Polypropylene Handle 3"
$37.32 FDick 8144809 Eurasia Japanese Style Paring Knife 3-1/2"
An indispensable addition to any busy commercial kitchen, the Winco KWP-3046 46-Piece Paring Knife 3-1/4" Bulk Pack includes (7) handle colors - black, blue, brown, green, purple, red, and yellow. This set is perfect for color-coding kitchen tasks to prevent cross-contamination, ensuring food safety. Each piece from this paring knife set is equipped with a short, razor-sharp X50 Cr MoV15 German steel blade that delivers superior performance and unparalleled durability. 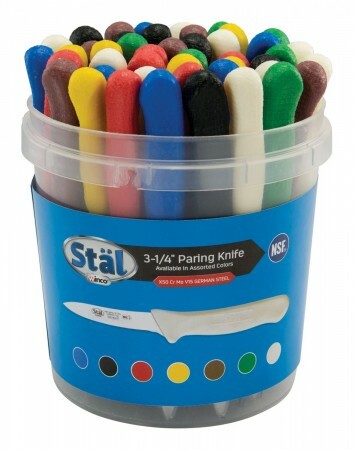 Thanks to their ergonomic, non-slip polypropylene handles, these well-designed paring knives provide a balanced and controlled grip for easy handling. Additionally, each piece from this set has a protective finger guard to prevent accidental cuts.